Ancient Greeks are believed to borrow the practice of tattooing from the Persians, and Romans, in turn, borrowed the technique from the Greeks. Throughout classic Greek period, tattoos mainly served as identifiers for persons ritually polluted, they were used to mark slaves and criminals, the term used for these marks was stigma (Goffman 1963). Gladiators and soldiers are also believed to carry tattoos on their faces that were rather of decorative purpose. 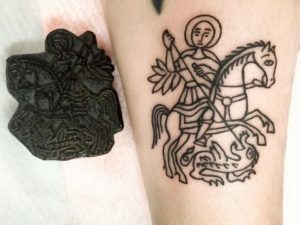 However, with the beginning of the rule of Constantine and his abrogation of Christianity prohibition tattoos were under ban as well. Following the very basic Christian postulates, Constantine believed that tattoos, and especially facial ones pollute the natural human look that represents god (DeMello 2007). With the religious-caused tattoo decay in the West, eastern cultures, mainly of China and Japan have practiced this kind of body modification for centuries. In ancient China tattoos were used to identify prisoners and in general this practice was considered to be an undesirable and in a way polluting body modification. In the same time in Japan, mainly starting with Yayoi period tattoos were used for body decoration, though eventually tattooing became a stigmatizing practice with a purely negative connotation. These body marks were given criminals as a punishment, and this use remained practiced until the Edo period, when the tattoo culture, influenced by woodblock prints, literature and art started to establish itself (DeMello 2007).